Our man Crane gets his props . . . .
Jason Crane has two interviews that were named among the Best Interviews of 2007 over at AllAboutJazz.com. 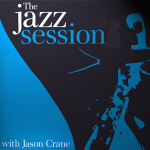 Click on over to The Jazz Session to check out those interviews and the rest of his jawboning with jazz artists (over 40,000 served . . . ). I know how difficult it is. You make it look sound easy, Jason. For those of you that don't know, Jason is no longer "our" man (as in Rochester's), but has moved to Saratoga Springs for his job at UNITE Here. His post on the move over at the Jazz Session (http://thejazzsession.com/2008/01/03/moving/) was published the same day as this one.